An article in the January 10, 2009 Toronto Globe and Mail's Business section, "Professional cheapskates give their 2 cents on coping during tough times", offered some good advice and reminders. I'm not linking it because that cheapjack rag will charge you $4 to download. "The single biggest mistake people make in financial planning is buying more stuff. Not convinced? Help a friend move- conspicuous consumption has overwhelmed us." If one has the means, there's more to life than strictly need; beautiful objects or sensory pleasures are on sale a t every turn. There are times when beauty lifts the spirit, sustains us. No, I don't need a lush fuscia cyclamen, but I'll enjoy its bloom for weeks in this bleak winter. It's the just-another category that I want to expunge. One of my girlfriends saw me at a holiday party. She admired my new sweater and said, "Oh, I've seen that skirt before." In fact, I wore it for the first time that evening. But I have several so similar, how could she tell? I'm determined to consume more thoughtfully, to reduce not only expense and clutter, but also because I feel lighter and happier when I wake from the trance of more. Very thoughtful post. I think about this often. Even though I am buying new clothes, my goal is to have just what I need for a functional wardrobe. Wast is my biggest pet peeve. Thank you for this great post. I think that sometimes fear motivates my consumption, e.g. if I find something that fits, I'd best buy two of them as I may never find something that fits again or in that color again. I do this with pants, and sometimes tops. Weird. I'm always tempted by lovely scarves and handbags, regardless of the army of them already in my service, and I'm making a conscious effort to resist these days. This is illustrated most clearly when one moves -- our last big move, we were appalled by how much was left to go to the dump even AFTER the garage sale and consigning boxes and boxes to the Sally Ann. And a year later, when we liberated the storage locker we'd paid over $100 monthly for, we realized that we didn't really need a quarter of those items. We've tried to be more careful since, but it's not easy. I just bought some beautiful dresses last night :-) They're like art, I love them! Just the one pair of unworn shoes Duchesse?! I hate it when the clutter in my house also takes up residence in my mind - then I really feel the relief of purging. I constantly struggle with the urge not to buy more and have been doing okay, but books and flowers are my weakness. materfamilias: Dan Pink, author of "A WHole New Mind", cites the prevalence of storage facilities as a key indicator of the "affluenza" of the developed world. Moving is a sobering experience. Wendy: Can't wait to see. Pseu: Oh I do that too! Then find the second item stuffed away unworn, tags still on. Back in the day when I lived with GFs we swapped our things around so they actually got more use. I should return to that practice! Cybill: I have huge boxes of shoes labeled "Not Worn Much". These are the only new ones. The perennial problem. I wrote a post a little while back inspired by a New York Times article that cited a French intellectual; he said something along the lines of "Death to luxury goods." To that I contrasted the famous "Reason not the need" speech from King Lear. Vacations are especially dangerous. 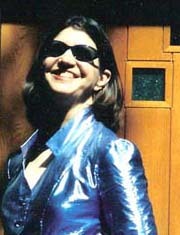 I have a friend who went to a fully funded conference; this made her so giddy that she bought a $400 TEAL leather coat--and this was 20 years ago. I don't have a conclusion here or any words of wisdom, but check out that French philosopher, either in the NYT or in my post. Or..as per yesterday...if you already discussed this in your post and I read right over it, forgive me yet again. I am so tired from work! Yes, I am trying not to limit my addiction to the cult of "more". It is not as easy as it sounds, but I hear you about the black flats, and the things that are so similar to other things back at home. It has been too long since I moved, but a few family crises have brought home how much of a burden the stuff of life can be. One of my favourite quotes of all time was from Mahatma Gandhi: 'Never own more than you can carry'. I do not say that I live my life by it, but in these days of cutting back and more frugal living it's a consolation. And recently I'm rediscovering clothes that haven't seen the light of day for several years which is better than having new as it's like rediscovering old friends. I made an assessment of my wardrobe recently and decided that it's lacking nothing. I have an outfit for every occasion that life throws my way and the same for jewellery. So I'm not buying anything at the moment. I've avoided all the post-Christmas sales (except a pair of brown bootees which I really did need as my last pair were letting in water!) and I do feel much better for it. It's like only eating when you're really hungry - your food is so much tastier! And I agree that too much materialism clutters the mind. With pared down consumption suddenly that beautiful fuchsia cyclamen can be seen in isolation and its beauty can fill the senses. Spirituality needs space to live and breathe. However, let's remember that we are the lucky ones who still have the power to decide whether or not to buy - how many now no longer have that choice? GP:I agree. Reminds me of what a friend was told when he joined the Peace Corps: "Remember you bring more in your (one) suitcase than most people in your host community own. "Many business writers are urging North Americans to "spend to stimulate the economy", which is what got so many people in trouble in the first place. I understand deflation, but don't think it's an imminent threat. Frugal: Something more to go on would help me, like a link to your post or the date. Mardel: My mother gradually reduced her "stuff", yet at 98 died with an apartment stuffed full of odd things like marrow spoons, stimu-dents and dozens of handbags. Maybe the stuff props us up? This is a very timely post; I think it is the sort of thing that has been on many of our minds recently. I have started trying to clear out some of my clutter - it started when I had my bedroom redone and got rid of the 3 double fitted wardrobes that had hidden 14 years of accumulated rubbish. I was horrified at just how much I had hoarded in there. I am also now gradually working on the rest of my clutter - my 16 year old daughter catalogued my books for me during a recent holiday as she was bored and I found I had numerous duplicates! I found a book swap website and have traded a number for books my daughter wanted. I too have called a moratorium on buying clothes - in my case because I have put on a lot of weight in the last year. If I refuse to allow myself to buy any clothes till I have lost that weight, it will give me an incentive. The only thing I can't resist is black ankle boots - but then, my weight doesn't affect the fit! Great post, Duchesse. That feeling you are getting is like fasting; you are left clear, light in the head, refreshed by restraint. Your friend's comment about your skirt just goes to show how our society has become so "disposable." A skirt worn twice? Wow! She really must LIKE it! We all are going to learn SO much from this grey time, Duchesse. We're going to humbly change forever, and we're going to look back in embarrassment at our own and our country's (well I can speak for the U.S. here) excesses. P.S. The cyclamen goes on the grocery budget, so no worries! Alienne: Book swap! I'm going to find this. In my experience decluttering takes constant attention. Karen: Yes, a time of examination: ia so like how people are talking about this instead of just "work, buy, display, repeat." Here's the article Frugal is talking about, I think, called "In the Lap of Luxury, Paris Squirms." A lot of interesting ideas in there, and some great quotes! Sisty; Thanks so much, realize I'd read it, enjoyed re-reading, and others will also appreciate the link! A mere five slices of foie gras will do me just fine! Your last paragraph was indeed the money quote (no pun intended). How very well stated!